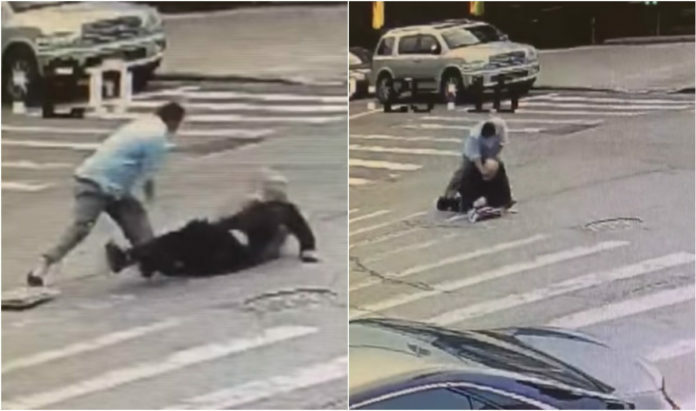 Radio talk show Michael Savage addressed the horrific assault of an elderly Hasidic Jew in Boro Park earlier this week – which is shockingly not considered a hate crime. Savage blamed NYC Mayor Bill Deblasio, a Democrat, for the decision to drop the hate charges against the suspect, car service driver Farrukh Afzal. This despite reports he shouted “Allah”, said he wanted to “kill all Jews” and made references to Israel during the likely unprovoked beating of 62-year-old Lipa Schwartz. Next articleSCHI Auction Offers YWN Readers Special Coupon Code Below! We need to VOTE REPUBLICAN for all the candidates (except our own heimishe candidates) even if the republican is unlikely to win. We need to show President Trump that we are with HIM. Why don’t the Republicans run serious candidates in New York City? What a dumb comment from the mocker of Torah and yiddishkeit. So if there was a Republican mayor this attack wouldn’t have happened?! 9/11 happened under Giuliani, so why do people vote Republican? Terrorists and haters don’t care how you vote or who’s in office. Yes, He is right. I was extremely shocked and very sad to read what happened!!! We should vote for persons who are friends with us and think about our survival. I believe and trust G-d is our true friend and our survival is through His mercy to us, and good people in power are sent from G-d for our help, too. Their religious leaders need proper religious education to guide their cattles correctly or their religious leaders brain wash their youth!!!! To be wild and dangerous beasts!!!!!! So scary!!! This terrorist who dared to hit the Jewish elderly should be deported out of USA back to the zoo he came from. Canada’s doors are open to them. These terriers should NOT be in USA. We should “all vote” for laws which keep wild beasts “ out”of this beautiful green peaceful land, they should be in deserts. There should be laws to keep these beasts under control and do NOT give them “green card”. If the beasts have green cards sadly, then do NOT make them citizens bunch of killers go after elderly and hit us walkjng in the streets or should we all hide in our homes in fear of these beasts. “””””I heard one trick they do when they go to visit their families overseas and it pass 6 months of green card (the foreigners who have green cards should be not away over 6 months or their green card will be expired, hopefully and prayerfully) they do the trick and come from borders of “Canada” and falsely claim that they were in Canada all the time (they go to overseas through Canada and come back from Canada to trick the officials borders (they also change their passport to not know what overseas countries they had been!!!) and they used to enter USA by Lies and tricking, the officials on USA and Canada borders should be aware of the tricks of these Middle East foreigners, other trick they do that they claim that they are “Christians” falsely to trick the officials. I even heard some put some crosses neck laces over their necks to say they are chrisants and trick officials to come here!!!!!!!! !from boarders of Canada, most of them come from boaters of Canada to USA. The police in airports should look at the names and the place of the birth and be extra careful. These foreigners beasts kinds know a lot of tricks and lies how to maintain their green cards!!!!!! The official borders should become so smart, wise and open theirs eyes wide open. Michael is 100% right. Yidden should not be voting for Democrats in general. & certainly not for liberals like Deblasio, who do not share our moral & ethical beliefs. Can you post the video without YouTube? It does not matter by chasidim if the Democrat candidate stands for things that are contrary to Judaism!!! Now i wanna see our Jewish politicians fighting for our rights and making sure to overturn this verdict. I want to see, Hikind, felder, eichenstien, yaeger do what they have to do to bring rightful justice to our/their community and bring justice to this muslim rat! Our future votes should depend on this. @rt you missed the point- savage is angry that the mayor didnt call it a hate crime; yes if Guiliani was mayor it would MOST CERTAINLY have been called that! not that it wouldnt have happened! RT he wasn’t blaming him for the attack but for his decision to drop the hate crime charge. Next time try reading the article first. Guys, please don’t be harsh on rt. He simply values liberal democrat politics and ideals over frumkeit. He rather see democratic leadership strengthening LGBT, abortions, funding for Palestinians, and “women’s rights” over our Frum values. After all, everything is Trunp’s fault in the world (sarcasm). Savage in a Jewish Anti-Semite, self-hating Jew. He has numerous times condemned those who practice the Jewish religion. New Yorker at heart: Chasidim vote Republican. Kiryas Yoel voted for Trump. So did Jewish Williamsburg and Boro Park. If you look at an election results may, those frum neighborhoods look as red as Texas. Rt is an idiot. Dont speak if you are an idiot.